An extensive terminology has evolved to cover standing and emerging issues related to refugees and migration as they also relate to the larger fields of human rights and development. This handbook takes stock of the present use of some selected terms and concepts. It is designed to be accessible to a general public which may not be familiar with the detailed discussions in the field of refugee and migration policy. 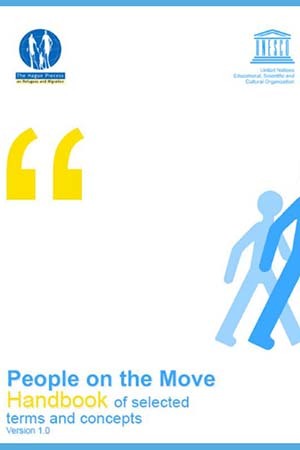 Civil society and the business sector play an increasingly important role in migration, and we also hope this handbook may be of use to them. Another intended audience is the media, firstly because many of the current perceptions on migration and refugees are shaped there, and secondly because terms are often incorrectly interpreted in media coverage. Words matter, for labels impact people’s views and inform policy responses. Brief comments are provided to complement the definitions proposed, to cover related terms or to highlight some issues behind the words. Persons & Statuses: to identify the fundamental distinctions between the various persons concerned. Terms and Concepts: to provide insights into the realities of the field and clarify emerging or recurrent topics. Concepts of Reference: to frame discussions within a human rights and development perspective. This entry was posted in Publications and tagged Migrant, Refugee, Terminology by THP. Bookmark the permalink.